We’d love your help. 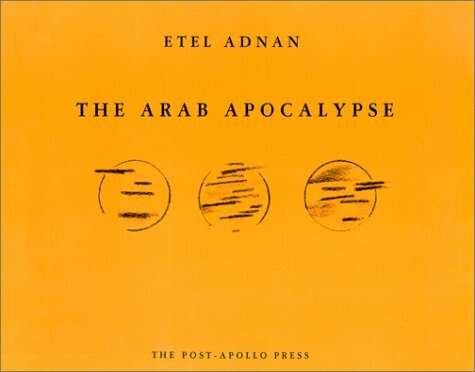 Let us know what’s wrong with this preview of The Arab Apocalypse by Etel Adnan. Poetry. Middle Eastern studies. Translated from the French by the author. Reprinted with a new foreward by Jalal Toufic. "This book, a masterwork of the dislocations and radiant outcries of the Arab world, reaffirms Etel Adnan, who authored the great poem, Jebu, as among the foremost poets of the French Language. THE ARAB APOCALYPSE is an immersion into a rapture of chaos Poetry. Middle Eastern studies. Translated from the French by the author. Reprinted with a new foreward by Jalal Toufic. "This book, a masterwork of the dislocations and radiant outcries of the Arab world, reaffirms Etel Adnan, who authored the great poem, Jebu, as among the foremost poets of the French Language. THE ARAB APOCALYPSE is an immersion into a rapture of chaos clawing towards destiny, and nullified hope refusing its zero. 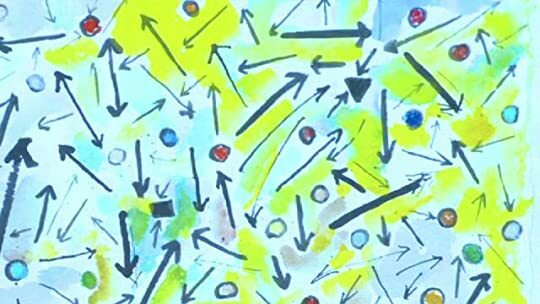 Is is also the journey of soul through the cartography of a global immediacy rarely registered by maps, replete with signposts like hieroglyphs in a storm of shrapnel and broken glass. And above all it is a book that, though capable of being read in its orderly sequence, has so surrendered to 'being there, ' it can rivet the sensibility to the Middle Eastern condition at any point in the text--so rapid are its mutations, so becoming its becomingness--like a wisdom book or a book of Changes"--Jack Hirschman. To ask other readers questions about The Arab Apocalypse, please sign up. my god we are the terrible sun. my god we are terrible and full of stunt and hurt and my god alarmed earth and alarmed water. please save me etel. please haunt me. My pain is mounting the sun like a racing horse. I admit: I really hated the poem at first! But when I read the whole thing I knew what an idiot I was! This poem was a BIG MOMENT OF EPIPHANY for me. A blue acetylene sun died of frost in the presence of a palm tree. In death one plus one makes three! This is a poem that shows you the brutality of fact, and the cruelty of reality. It WAKES YOU UP! It is just like Eliot's human voices which wake you up to face the fact that: "we drown". Etel Adnan offers no hope in her poem, she only foresees destruction and a horrible overwhelming "night". So, make sure that you wake up and become a candle amidst all that cold and all that dark. O caravans of hunger and curiosity O passion for Space! They killed the dream with an axe! with an axe! with an axe! The BIG RED SPOT of Jupiter is a storm. Matter is desperate. What to do with the sun when it hides behind tear gas? Drink it. Drink it in little sips so that tenderness resembles hell. I would love to place you in the heart of the night ma O caravans of hunger and curiosity O passion for Space! Etel Adnan's The Arab Apocalypse is a book that defies what we consider to be the norm for form. It is at once experimental and historical, serving as a critique and reflection on strife in the Middle East - specifically, in Lebanon. For the most part, it is largely impenetrable. The language is fractured and scattered and "graphic signs" (as described in the introduction by Jalal Toufic) are placed throughout stanzas of what is best described as poetry. 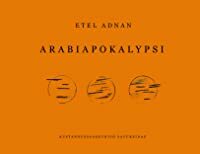 The impenetrability of the book is most l Etel Adnan's The Arab Apocalypse is a book that defies what we consider to be the norm for form. It is at once experimental and historical, serving as a critique and reflection on strife in the Middle East - specifically, in Lebanon. For the most part, it is largely impenetrable. The language is fractured and scattered and "graphic signs" (as described in the introduction by Jalal Toufic) are placed throughout stanzas of what is best described as poetry. 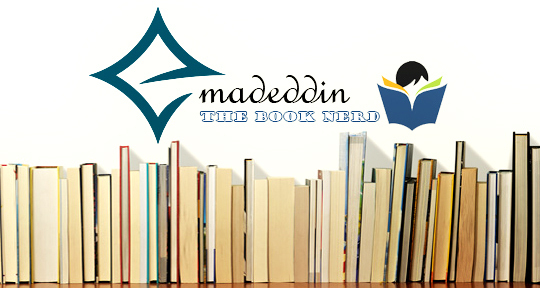 The impenetrability of the book is most likely highly intentional. The Arab Apocalypse was not intended for Western audiences - it is written by a Lebanese artist and poet and intended for Arabic audiences. As the introduction states, "it seems that the author, also an artist, had already translated it into graphic signs for so many Arabs [...] who are illiterate, for whom Arabic is as illegible as English and French - may they be jolted by its graphic signs...intro, at last but not least, learning to read - and then actually read." cannibal anthropophagus sun wart on the cargoes ! ! ! ! ! ! To describe this as stream of consciousness would be largely inaccurate. Instead, we should look at the book as a text that attempts to capture the internal workings of the mind in war and suffering. As previously stated, the graphic elements are a reflection on illiteracy. But the greatest meaning comes from the way that Adnan seems to say to the reader, "I don't have to write how you expect me to write because the Western world doesn't expect writers from the Middle East." 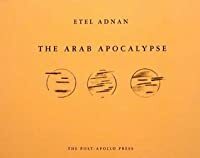 Etel Adnan’s The Arab Apocalypse is a book of poetry that takes the reader through the ravages of the Lebanon Civil War. 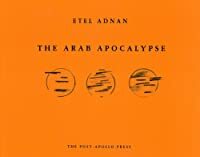 Most notable to readers of The Arab Apocalypse is Adnan’s incorporation of pictographs that signal to reader’s deep alarm as they experience a deep sense of alienation upon attempting to construct a system of understanding. This alienation is so alarming to readers because it highlights a lack of awareness— which readers either dismiss on the premise that the pictographs are n Etel Adnan’s The Arab Apocalypse is a book of poetry that takes the reader through the ravages of the Lebanon Civil War. Most notable to readers of The Arab Apocalypse is Adnan’s incorporation of pictographs that signal to reader’s deep alarm as they experience a deep sense of alienation upon attempting to construct a system of understanding. This alienation is so alarming to readers because it highlights a lack of awareness— which readers either dismiss on the premise that the pictographs are nonsensical, or they pay close attention to this gap of understanding in an earnest attempt to capture the projected and intended meaning. Both reactions to the pictographs suggest that perception is not universal, nor are readers reactions to what is perceived. While the pictographs are consistent throughout the text, they don’t impede the readability of the text; when a reader forgets and then begins to pay attention to the pictographs, they attain a certain depth acquired through the performative logic that is best demonstrated in the quickly scrawled pictographs, capturing the narrator’s peril and psychological turmoil. Readers who do not derive such meaning, even still, experience their own terror at being unable to reconcile the meaning. Readers who do arrive at meaning, experience the horror of understanding exactly what the pictographs mean. These perceptions of the pictographs occur simultaneously, which is rather different, I think, for western readers who tend to intellectualize the matter that is being perceived— holding the matter at arm’s length. At end, you have an author who is asking readers to construct the warfare in Lebanon beyond their comforts, beyond their cultural lens, beyond their cultural gaze, beyond practiced and learned objectivity. In many ways, the use of the sun is in concert with the idea of an epicenter within the cosmos. This is perfectly appropriate as we receive imagery of Moses as a yellow sun (p. 17), as Syrian and Israeli sentiments help to fuel opposition within Lebanon. 'On the brink of unintelligible' is the way one might describe this text. To be perfectly honest if I were not obliged to continue reading this work I would have almost certainly stopped after the very first page, if I'd even made it that far. However, upon delving further into Adnan's glyph-poetry, it becomes clear that the author does, in fact, have an incredible grasp on language and the acute knowledge of what imagery will most affect her readers. I found myself almost lulled into a sense of 'On the brink of unintelligible' is the way one might describe this text. To be perfectly honest if I were not obliged to continue reading this work I would have almost certainly stopped after the very first page, if I'd even made it that far. However, upon delving further into Adnan's glyph-poetry, it becomes clear that the author does, in fact, have an incredible grasp on language and the acute knowledge of what imagery will most affect her readers. I found myself almost lulled into a sense of comfort by the nonsensical passage of words and symbols on the page, practically glossing over them when all at once I would read a line so startling I was forced to pause and imagine, in my own mental fabrication, what exactly those scenes would look like. It was exactly those soft explosions catching my attention that caused me to become more engrossed in deriving a singular, distinct plot line, and, consequently, caused me to grow more and more lost with each page. As mentioned earlier, Adnan's command of the language makes me wonder whether the text would have been more effective as a piece of prose, yet the schizophrenic way the glyphs appear, slapped on the page like tiny, disruptive bombs, evoked for me a sense of war on the reader. It was utter chaos and when the dust cleared for a few moments at a time it was only to reveal a harrowing scene of human suffering, just long enough before jumping right back in to the unintelligible. Reading without understanding. Knowing without knowledge. If I continue making up platitudes, I’m sure something will stick that appropriately describes The Arab Apocalypse’s unique phenomenology. In the Hollywood sci-fi blockbuster Arrival, the two main characters are asked to decipher an alien language built on symbols. In understanding the language, the characters rewire their brains to conceive of time outside of anglo-saxon (?) linearity, which more or less ‘solves’ the language and conclud Reading without understanding. Knowing without knowledge. If I continue making up platitudes, I’m sure something will stick that appropriately describes The Arab Apocalypse’s unique phenomenology. In the Hollywood sci-fi blockbuster Arrival, the two main characters are asked to decipher an alien language built on symbols. In understanding the language, the characters rewire their brains to conceive of time outside of anglo-saxon (?) linearity, which more or less ‘solves’ the language and concludes the movie. Nonesuch resolution waits for us, here, reading t.A.A. However, through reading the text and examining it is an object, we can, if only momentarily (i.e. while interfacing w/ this object), begin to shift our understanding of a text, textual objects, language. In viewing the text as an object I can do the following, in variant and recurring orders: hold the text; smell the text; read one page; look at the cover; read a different page; look at the first page; place the text over my face like a mask; flip through the book’s pages, watch text fly by; skip certain words; skip certain pages; examine the book’s orange cover with black text, look at the calendar, think about pumpkin pie; et cetera, et cetera, ho-hum. I am not a stranger to poetry, but I’m not entirely sure what Etel Adnan was trying to accomplish with her poetry book The Arab Apocalypse. Perhaps it is because I’m not Arabic. Perhaps it is because I’ve never directly dealt with war or suffering. Maybe, as an American and a white person, my privilege, (which I fully recognize), hinders me from seeing through the eyes of one who has truly known hardship. But I believe that poetry should speak to people on a universal level. That being said, I d I am not a stranger to poetry, but I’m not entirely sure what Etel Adnan was trying to accomplish with her poetry book The Arab Apocalypse. Perhaps it is because I’m not Arabic. Perhaps it is because I’ve never directly dealt with war or suffering. Maybe, as an American and a white person, my privilege, (which I fully recognize), hinders me from seeing through the eyes of one who has truly known hardship. But I believe that poetry should speak to people on a universal level. That being said, I do recognize certain elements of the craft which Adnan achieved. This is a great example of form mimicking content, as there is never a straightforward narrative or story, and the lines and words all seem chaotic in nature. This is true even down to the black symbols and illustrations on the pages. Those very symbols are what made me weary of the form. Personally, I’m not a fan of anything that seems “gimmicky” when it comes to the structure and form of poetry. I believe that traditional stanzas, couplets, tercets, quatrains, etc. are usually apt at creating tension or other feelings, and resorting to seemingly extraneous symbols takes away the power that words and form hold alone. I think the beauty of poetry is in the word choices alone, and poets concentrate on every word and placement to hold meaning. This review has been hidden because it contains spoilers. To view it, click here. The Arab Apocalypse is a collection of 59 poems that center around the sun and the Lebanese Civil War. The lines are highly fragmented in terms of spacing, the use of glyphs, and subject changes that are not marked by traditional punctuation. As Etel Adnan is also a visual artist, I think that one of the most important parts of the book is the sense of subjectivity that each reader brings to it. The text itself is non-linear and it essentially jumps from one image to the next with more of a goal The Arab Apocalypse is a collection of 59 poems that center around the sun and the Lebanese Civil War. The lines are highly fragmented in terms of spacing, the use of glyphs, and subject changes that are not marked by traditional punctuation. As Etel Adnan is also a visual artist, I think that one of the most important parts of the book is the sense of subjectivity that each reader brings to it. The text itself is non-linear and it essentially jumps from one image to the next with more of a goal to create impressions than describe specific events: "sun spinning top incredibly spinning instead of our eyes" (39). Interspersed throughout the text are often (seemingly) random spaces, which are sometimes accompanied by glyphs. The glyphs themselves are varied; some of them are ancient symbols that have been used throughout various cultures while others seem to be symbols that Adnan created. Both of those elements lend to a very open interpretation of the text as a whole. As a commentary on the Lebanese Civil War, I did not get much from the text because of its non-linear nature. However, as an exercise in form and structure, the poems were interesting and thought-provoking. I think that most writers want to guide readers' thinking more than Adnan does in Arab Apocalypse, especially about such a serious topic. But in ceding control, the book allows the reader to make their own meaning and interact with the images in the way that will make the most impact for them. Coming from someone who generally stays away from poetry I really enjoyed this. A lot of it (or should I say all?) does not make any sense to me, but I think that's what makes this good and unique. There's an element and I'm not sure if it is the way in which everything is kind of scattered with no organization, or the symbols on the pages, but something about it feels organic and authentic which I liked. This book isn't trying to be anything other than what it is which in my opinion is authentic Coming from someone who generally stays away from poetry I really enjoyed this. A lot of it (or should I say all?) does not make any sense to me, but I think that's what makes this good and unique. There's an element and I'm not sure if it is the way in which everything is kind of scattered with no organization, or the symbols on the pages, but something about it feels organic and authentic which I liked. This book isn't trying to be anything other than what it is which in my opinion is authentic. I took the disorganization of the book and poetry to mimic the way in which our brains and thoughts work in situations of high stress. When reading this I got the idea of it being like war and how people don't think they just go on instinct in order to survive. I don't know if I'm wrong in that reading of this, but that was how I took it. I will be honest. This is the type of poetry that I struggle with. It's very abstract at first, and doesn't giver you more than some imagery through brief phrases. Not only that, but you have glyphs to contend with on the page, which constantly draw your eye to them, but do not always have apparent meaning. The first half of the book is really hard to get through. In most of the poems, you only get a phrase or two that really tells you anything about the events that Adnan is describing. But if y I will be honest. This is the type of poetry that I struggle with. It's very abstract at first, and doesn't giver you more than some imagery through brief phrases. Not only that, but you have glyphs to contend with on the page, which constantly draw your eye to them, but do not always have apparent meaning. The first half of the book is really hard to get through. In most of the poems, you only get a phrase or two that really tells you anything about the events that Adnan is describing. But if you can stick through the first half of the book, you should start to grasp Adnan's meaning. A sun is yellow, green, red, blue. A sun is floral. I don't know what anything on the first page means. I don't know what 90% of the poetry means. Most of it seems like a perpetual list, a sense of never ending chaos. Once I read a page the one before it is completely forgotten since I can't keep up with it. First person point of view introduced on page 11. Father mentioned on 15. Beirut grounds the reader with a location. War is here. "The Arabs' sun is a perennial atom bomb drinking milk..." (52). perhaps i read this book too quickly...meaning i was trying to write a ridiculous report on it and its classroom value...yuck...wait...double yuck! and perhaps my tolerance for poetry is of late unfortunately as good as my attention span which can barely watch a full episode of Weeds. All that said, i liked this book but at times just grew tired of it's repetition..and not via my beloved anaphora...unless you consider it a metaphor for dancing...ha. Etel's operatic, destructive, intensive, tragic, epic of the destruction of the Arab world. If it was a song it would be thrash metal, if it was a Shakespeare play it would Hamlet. It's absolute currency is made more tragic by the fact it was written in 1980 (in French) and now reissued in Etel's self-translation to English. Etel Adnan was raised in Beirut, Lebanon. Because her mother was from Greece and her father was from Damascus, Adnan grew up speaking Greek and Turkish in addition to Arabic and French. Etel Adnan earned degrees at the Sorbonne in Paris and studied at Berkeley and Harvard. In 1972, she moved back to Beirut and worked as cultural editor for two daily newspapers—first for Al Safa, later for L’Orient Etel Adnan was raised in Beirut, Lebanon. Because her mother was from Greece and her father was from Damascus, Adnan grew up speaking Greek and Turkish in addition to Arabic and French. Etel Adnan earned degrees at the Sorbonne in Paris and studied at Berkeley and Harvard. In 1972, she moved back to Beirut and worked as cultural editor for two daily newspapers—first for Al Safa, later for L’Orient le Jour. Her rich body of work documents an unblinking witness to beauty in nature, human beings and art; to cruelty, especially as enacted in the mindless violence of war; and to the power of love and human perseverance. She published her first novel in 1977 entitled, “Sitt Marie-Rose”. The well-received book won the “France-Pays Arabes” award and has been translated into more than 10 languages. Its influence was so strong that it instantly became a War Literature classic. In her later years, she began to compose a slew of novels and several books of poetry reflecting her lesbian identity, making her a symbol for the Arab LGBT community as well. Adnan is considered one of the world’s most accomplished Arab-American artists.